International CV series of Class 4/5 trucks. With the addition of the CV series, Navistar now offers International trucks from class 4 through 8, meaning that commercial customers who regularly buy heavy-duty Internationals can stick with a familiar brand and dealer for all of their truck needs. "The Class 4/5 market is a large one, and about half of it is the category we serve, the diesel conventional market. 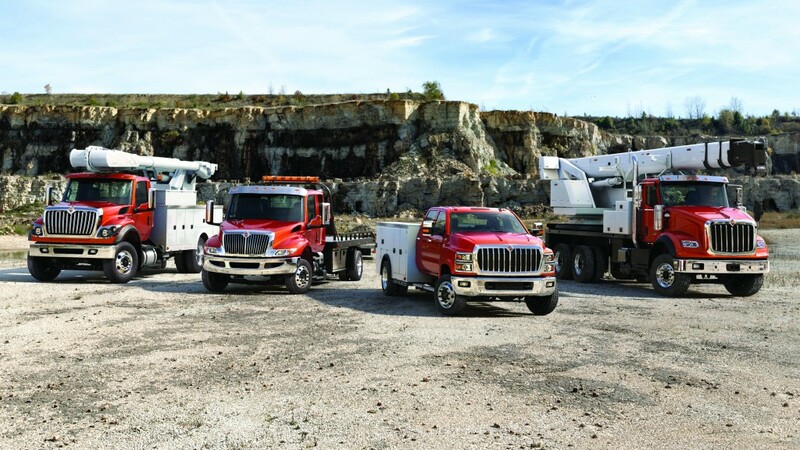 There are many applications – construction, service trucks, utility trucks, landscaping – they just go on and on," said Chad Semler, Navistar vocational marketing manager. "It's a great fit for a lot of people who need this size of truck." The CV series is built in partnership with GM, and is designed to be a versatile truck built around an engine that can handle any power needs customers may have. Under a commercial-style forward-tilting hood is an International 6.6-litre diesel powerplant generating 350 hp and 700 lb.-ft. of torque. The engine is paired with one of two Allison automatic transmissions, and paired with Dana axles the truck is capable of up to 37,500 pounds GCWR. Semler said diesel remains the preferred fuel for trucks in the Class 4/5 sector. "I know gasoline has been showing some increases in market share, and that may come about in the future – there's always interest in expanding our powertrain offerings," he said. "The prevalent power plant is diesel; you get the greatest power, and your torque availability is very good. Right now, diesel prices are great, so it's a good choice." Commercial trucks need to be ready for a range of jobs, and the CV series has been designed with upfitting in mind, Semler said. "We have quite extensive knowledge and experience with body builders, body integration, control integration and other factors. So we took that into consideration when designing this truck," he noted. One key in the design is the inclusion of straight frame rails with no obstructions from cab to axle, something that makes life easier for body builders. "There are no rivets protruding beyond the top of a frame rail that a body builder has to leave clearances for on their subframes – it makes things a little easier for them," Semler said. "We offer a variety of options to fit the various bodies that are out there." Some other considerations for body builders include the inclusion of HuckBolt chassis fasteners – something borrowed from larger International offerings that provides superior clamping force without re-torquing and hold tight even in extreme environments. In addition, the series features a dual battery box under the cab, as well as multiple fuel tank options, optional exhaust outlets and multiple wheelbase options. CV owners will be able to access International Truck Specialty Centre experts who can provide quick, efficient and cost-effective custom engineering solutions. Drivers have been kept in mind during the design process, Semler noted, as more truck owners are keeping employee retention in mind when they purchase new equipment. "There's a lot of discussion in the over-the-road world about driver shortages and turnover, and that is also in the vocational market. You want to have the most comfortable, pleasing environment that you can, to keep your drivers happy," Semler said. "This is their work environment. In the vocational world, a lot of times it's also their office, so you need to keep that under consideration." That consideration starts right at the door – International has included a step that is designed to allow a natural, easy entry and exit from the cab. Inside, the truck is fitted with large gauges and good lighting. "There's access to some of the conveniences that drivers have come to expect, carrying over from their cars – there's a large centre display for rearview backup cameras, there are options for Apple CarPlay, navigation. . . you can really add functionality to the interior," Semler described. "It's available in a day cab as well as crew cab, because a lot of these trucks are tools used to bring crews to a work site. We have to make that cab as inviting and roomy as possible and provide storage for tools and all the things drivers bring with them." Comfort options also include what International says is the segment's only optional air ride suspension with an engine-mounted compressor, which can be used to adjust height and provide a smooth ride for cargo protection and crew comfort. Designers also kept service and maintenance in mind when developing the CV series. One of the most obvious design features that comes from these trucks' larger cousins is the hood; instead of lifting up like a pickup truck might, the hood on the CV tilts forward like those on heavier-duty trucks. "This really eases maintenance, and even your daily fluid checks. With an alligator-style hood that can be difficult, because you can't always reach," Semler said. "You don't need step stools and such with the CV series – you tilt the hood forward and have great access to every checkpoint on the truck. In addition, you need to do maintenance after several thousand miles, and you'll have easier access to make those repairs and component changes under the hood." CV series trucks are in production now, and will start arriving on the market in the near future at International dealers – one of the biggest advantages customers will receive when choosing these trucks over competitors, Semler suggested. "A lot of competitors in this market are automotive-based, and their service network is set up as a consumer automotive-based network. A lot of times, you may find that a car dealer. . . may not have the diesel technician needed to work on a diesel truck, or they may not have the equipment to lift a 20,000-pound truck with high clearances," he said. "At an International dealer you won't run into those problems because that's what International dealers do every day." International started training its technicians on the CV several months ago, and parts have been stocked in readiness for the trucks to reach market. Customers are also excited for the CV to arrive, Semler said, and the company is certain that it will have a strong spot in a tight truck market.